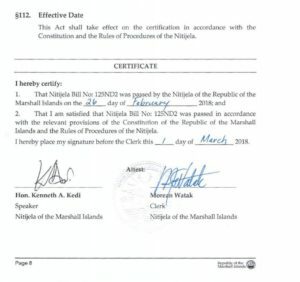 Marshall Islands President Hilda Heine’s plans to create a cryptocurrency that would function as a legal tender could be frustrated by the efforts of eight senators from the country who joined together to present a no-confidence motion after the IMF, and the United States expressed their disagreement. “Mr. Nemra said the Heine administration’s plan to establish a digital currency as legal tender had tainted the country’s reputation and generated criticism from major financial organizations, including the International Monetary Fund and the US Treasury Department. Marshall Island Situation: Patriotic Concern or Political “Eye for an Eye”? It is important to note that the political retaliation Mr. Nemra is attempting against President Heine was already used against him two years ago, separating him from the presidency (which Heine now holds). “Nemra, now in his first term in office, was briefly president in early 2016 before he was unseated by Ms. Heine in a no-confidence vote three weeks after his election in January that year. The motion will be debated and voted on Monday, November 12. According to the Constitution of the country, this type of actions should be discussed between five and ten days after they have been presented before the Nitijela (parliament). It is currently difficult to predict an outcome with any degree of certainty. The Marshall Islands parliament has 33 members who are now almost halfway between supporters and opponents of Hilda Heine’s administration. A simple majority is required for a decision to be made. 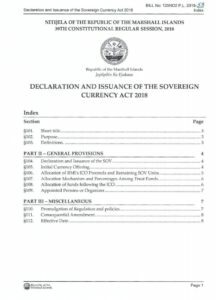 President Heine issued the “Declaration and Issuance of the Sovereign Currency Act” in early 2018. The act was approved by parliament on 26 February 2018.